Publix says they will not make any political contributions following a staged "die-in" at one of their stores. NBC 6 Reporter Jamie Guirola explains. On Friday, survivors of the Parkland school shooting protested Publix over the company's donations to politicians - including one top name in the 2018 race for Governor of Florida - that have been endorsed by the National Rifle Association or those who have not been supportive of the gun control movement. 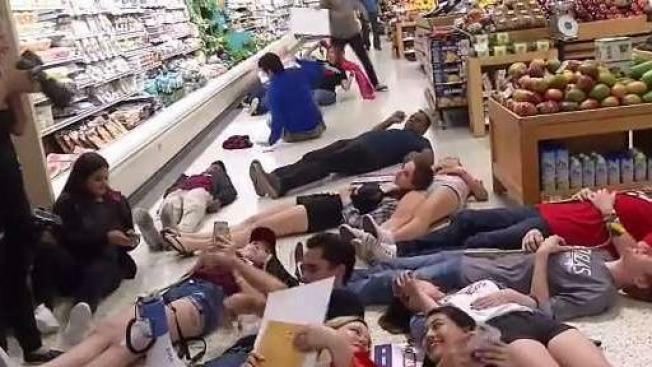 One of the leading voices in the movement, David Hogg, called for the "die-in" protests Friday afternoon inside Publix. Hogg and around two dozen protesters laid down in one Coral Springs store with the aim of disrupting business. Hogg spoke through a megaphone as pro-Publix and pro-NRA counterprotesters stood nearby. Some customers walked around the group to pick up items for purchase. The protest lasted for about 12 minutes. Hogg said the 720 seconds represent the number of school shootings in recent history. The protests started before 6 a.m., when Hogg, parent Manuel Oliver - who lost his son Joaquin in the shooting - were joined by others in drawing 17 chalk outlines of bodies in the parking lot of one location in Coral Springs ahead of the store's opening - one for each of the victims who died at Marjory Stoneman Douglas High School on February 14th. "This is actually what really happened in Parkland, we lost 17 persons," said Oliver. "One of them was my son. So every time we can show this and make statements out of it, we will do it." They are protesting Publix’s donations to conservative gubernatorial candidate Adam Putnam, who is pro NRA and anti-LGBTQ, according to the ACLU and the HRC, based on his voting record. “Publix can stand with us. They can pull out their half million dollars from Putnam's campaign and they can double that amount and donate it to the Stoneman Douglas victims fund,” said Hogg. The protest went on as scheduled despite a statement by Publix that they were suspending corporate-funded political contributions. "At Publix, we respect the students and members of the community who have chosen to express their voices on these issues. We regret that our contributions have led to a divide in our community," Publix's statement read. "We did not intend to put our associates and the customers they serve in the middle of a political debate. At the same time, we remain committed to maintaining a welcoming shopping environment for our customers." Hogg spoke with several people who came out against the group's actions, with both sides having a peaceful debate. "From talking to him, I have seen his side and I do agree that mental health is an issue that he’s really pushing and that it’s not about taking away guns from everybody," said Tim Martin, a Republican voter. "As American citizens, we can sit down and understand that we have disagreements but we can work towards, for example, behavioral health programs," said Hogg. Some customers said Publix is not the enemy. "Publix has a right to contribute to whomever they want to contribute to," said shopper Patrick Johnson. "As a Republican, as a Democrat, as an independent, everyone has that right!"